What is the DB Function? 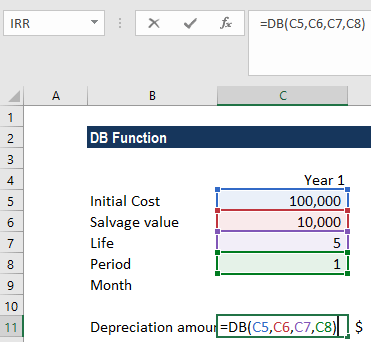 The DB function is a Financial functionFunctionsList of the most important Excel functions for financial analysts. This cheat sheet covers 100s of functions that are critical to know as an Excel analyst. The function helps in calculating the depreciation of an asset. The method used for calculating depreciation is the Fixed Declining Balance MethodStraight Line DepreciationStraight line depreciation is the most commonly used and easiest method for allocating depreciation of an asset. With the straight line method, the annual depreciation expense equals the cost of the asset minus the salvage value, divided by the useful life (# of years). This guide has examples, formulas, explanations for each period of the asset’s lifetime. Salvage (required argument) – It is the value of the asset at the end of the depreciation. Life (required argument) – It is the useful life of the asset or the number of periods for which we will be depreciating the asset. Period (required argument) – It is the period for which we wish to calculate the depreciation for. Month (optional argument) – It specifies how many months of the year are used in the calculation of the first period of depreciation. If omitted, the function will take the default value of 12. 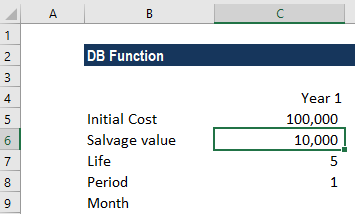 How to use the DB Function in Excel? Assuming we wish to calculate the depreciation for an asset with an initial cost of $100,000. The asset’s salvage value after 5 years is $10,000. Rate = 1 – ((salvage / cost) ^ (1 / life)). In the example, the value at the end of Year 1 has only depreciated over 6 months and the value at the end of Year 2 has depreciated over 18 months (6 months of Year 1 + 12 months of Year 2), etc. The given cost or salvage argument is less than zero. The given life or period argument is less than or equal to zero. The given month argument is less than or equal to zero or is greater than 12. The given period argument is greater than the life argument and we omitted the month argument. The given period is greater than life+1. For example, if the life of the asset is 5 years and we provided the period argument as 6 years with 12 months as the month argument.